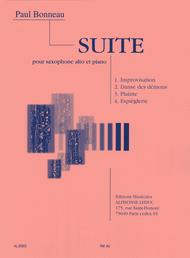 Suite for Alto Saxophone and Piano by Paul Bonneau was composed in 1944. Written in four short movements: 1. Improvisation, 2. Danse des démons, 3. Plainte, 4. Éspièglerie, Suite for Alto Saxophone and Piano is reminiscent of the early 20th century French Neoclassicism. This suite could be played by advanced-intermediate and advanced players, as the technicality is not too strong. Paul Bonneau (1918-1995) is a French classical composer. He adapted and wrote 11 ballets/operettas and arranged some pieces by Offenbach.